Congratulations to our June Employees of the Month! Ricky Roybal is being recognized for his extra work and effort during a time when the IT department has been in a state of transition. Ricky has taken on extra work and responsibilities and has worked extra hours whenever needed. He was the primary lead in getting the IT equipment ready and deployed in our new 2nd floor clinic area while continuing to provide day-to-day IT support for the Cancer Center. We greatly appreciate Ricky’s extra efforts as we’ve worked through an extended period of being short staffed and very busy. 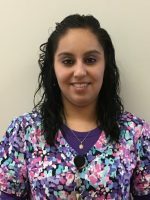 Serena Bailon, Lead Medical Assistant for Medical Oncology, is a valuable asset to the function and flow of the Medical Oncology Clinic. As the Lead MA, Serena helps with clinic flow, MA schedules, and training. Serena is always willing to help and always follows through with her commitments. We appreciate her hard work and dedication to the Cancer Center.